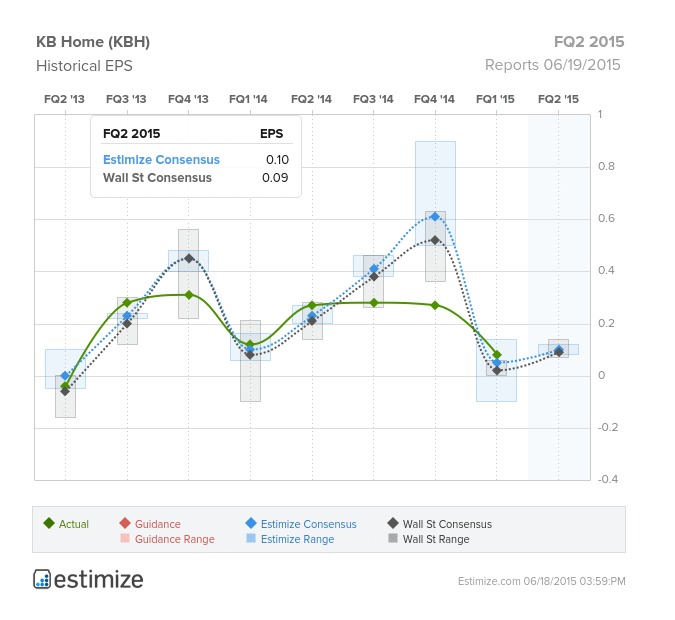 KB Home Earnings Expectations Are Low, But Could There Be A Comeback? KB Home (NYSE: KBH) is scheduled to announce second quarter financial results on Friday morning. According to Estimize, the homebuilder is expected to deliver a year-over-year decline in earnings of 62 to 67 percent. In the second quarter of 2014, the company reported earnings of $0.27 per share on revenue of $565 million. For the current quarter, the Street models consensus earnings of $0.09 per share on revenue of $655 million, while the crowd projects consensus earnings of $0.10 per share on revenue of $656.32 million. Nonetheless, these figures would imply a small rise from last quarter’s earnings of $0.08 per share and revenue of $580.12 million. One thing to be noted from the chart above: there is no clear trend in KB Home’s history to suggest a beat or miss this quarter. In a recent report, MKM Partners’ managing director Megan McGrath looked into the homebuilding sector and revealed her top picks. While many Wall Street analyst firms like Barclays or Citigroup don’t seem to be particularly fond of KB Home, MKM sees it as a value pick for sector "comeback player" of the year.